In Jamaica, Christmas wouldn’t be the same without Jamaican sorrel and Christmas cake. Sorrel is consumed most during Christmas time. 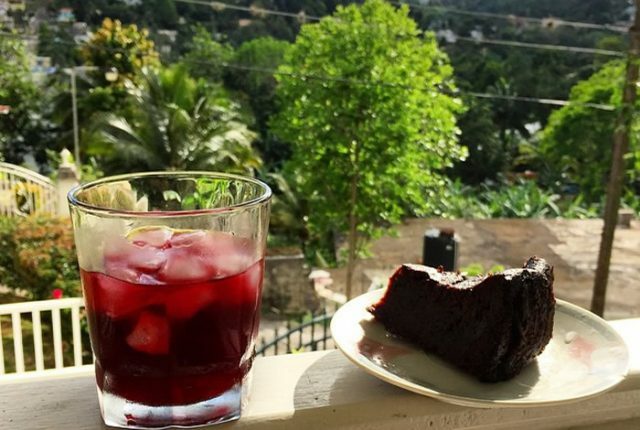 Jamaicans love the Jamaican Christmas cake along with a glass of Jamaican sorrel (prepared with rum and ginger) to wash it down. Health Benefits: The Jamaican Sorrel, harvested in late November to early December, (Hibiscus sabdariffa) provides high amounts of vitamin C, thiamin (B1), riboflavin (B2,) vitamin A, magnesium, calcium, and potassium. A group of compounds known as flavonoids are healthy chemical substances found in plants such as sorrel and is also responsible for its deep red colour. Flavonoids also strengthen the immune system. Sorrel also provides fiber — if pulp and seeds are used to make drink, stuffing or whatever dish or side item. Sorrel helps to lower elevated blood pressure, bad cholesterol and detoxify the entire body. In Mexico Sorrel is called Agua de Jamaica, which means water of Jamaica, but they don’t add ginger and rum. In Jamaica, we have ‘Sorrel Bag Juice and it’s also sold in bottles, which makes it available all year round; however, these products don’t contain alcohol. We also have Sorrel ice cream. Sorrel is used in many parts of the world for a number of health ailments. In India, Africa and Mexico it is used as a diuretic, to lower blood pressure and to stimulate the production of bile by the liver. In some parts of Africa the red calyx is used to relieve coughs, while the leaves are made into a poultice to relieve boils and abscesses. In Guinea it is used as a diuretic and sedative. In parts of Asia it is used as a tonic for weakness in the body and as a laxative as it stimulates intestinal peristalsis. It is sold in the market, so many Jamaicans buy it from the vendors packaged like this. Sorrel is very easy to prepare. You can use fresh or dried sorrel. Drying the sorrel allows for storage, from weeks to up months, depending on the quality. 1. Wash sorrel thoroughly, using your fingers to rub the buds in water. 2. Scrape and wash grate ginger. 3. Place a pot of water on the stove to be boiled; add ginger and pimento to water. 4. When the water reaches boiling point, turn off the burner and add sorrel into the hot pot of water to drawn. Use a fork to make sure the sorrel is totally submerged. Cover the pot with its cover and leave it for 6 hours to draw as it cools. 5. After 6 hours, strain the liquid over a larger strainer into a large container; use a spoon to squeeze more liquid out of the sorrel. 6. Add sugar and sweeten to taste. For every liter of sorrel and add 200 milliliters of rum. The sorrel plant also contains nutraceuticals, which are said to be helpful to people’s health. Nutraceuticals can help prevent and treat several diseases including diabetes, hypertension, heart disease, and cancer.